The ankh (/ˈæŋk/ or /ˈɑːŋk/; Egyptian IPA: [*ʕaːnax]; U+2625 ☥ or U+132F9 𓋹), also known as key of life, the key of the Nile or crux ansata (Latin meaning “cross with a handle”), was the ancient Egyptian hieroglyphic character that read “life”, a triliteral sign for the consonants ꜥ–n–ḫ. It represents the concept of eternal life, which is the general meaning of the symbol. The Egyptian gods are often portrayed carrying it by its loop, or bearing one in each hand, arms crossed over their chest. The origin of ankh is highly debated[who?] and it is represented by an oval or point-down teardrop set atop a T shape. It is by Egyptologists called the symbol of life. It is also called the “handled cross”, or crux ansata. It represents the male triad and the female unit, under a decent form. There are few symbols more commonly met with in Egyptian art. In some sculptures, where the sun’s rays are represented as terminating in hands, the offerings which these bring are many a crux ansata, emblematic of the truth that a fruitful union is a gift from the deity. E. A. Wallis Budge postulated that the symbol originated as the belt-buckle of the mother goddess Isis, an idea joined by Wolfhart Westendorf with the notion that both the ankh and the knot of Isis were used in many ceremonies. Sir Alan Gardiner speculated that it depicts a sandal strap, with the loop going around the ankle. The word for sandal strap was also spelled ꜥnḫ, although it may have been pronounced differently. The ankh appears frequently in Egyptian tomb paintings and other art, often at the fingertips of a god or goddess in images that represent the deities of the afterlife conferring the gift of life on the dead person’s mummy; this is thought to symbolize the act of conception. Additionally, an ankh was often carried by Egyptians as an amulet, either alone, or in connection with two other hieroglyphs that mean “strength” and “health” (see explication of djed and was, above). Mirrors of beaten metal were also often made in the shape of an ankh, either for decorative reasons or to symbolize a perceived view into another world. A symbol similar to the ankh appears frequently in Minoan and Mycenaean sites. This is a combination of the sacral knot (symbol of holiness) with the double-edged axe (symbol of matriarchy) but it can be better compared with the Egyptian tyet which is similar. This symbol can be recognized on the two famous figurines of the chthonian Snake Goddess discovered in the palace of Knossos. Both snake goddesses have a knot with a projecting loop cord between their breasts. In the Linear B (Mycenean Greek) script, ankh is the phonetic sign za. The ankh also appeared frequently in coins from ancient Cyprus and Asia Minor (particularly the city of Mallus in Cilicia). In some cases, especially with the early coinage of King Euelthon of Salamis, the letter ku, from the Cypriot syllabary, appeared within the circle ankh, representing Ku(prion) (Cypriots). To this day, the ankh is also used to represent the planet Venus (the namesake of which, the goddess Venus or Aphrodite, was chiefly worshipped on the island) and the metal copper (the heavy mining of which gave Cyprus its name). David P. Silverman notes how the depiction of the ancient Egyptian ankh was preserved by the Copts in their representation of the Christian cross, the coptic cross. The ankh is one of the best and most widely known symbols of ancient Egypt and it is often used as the graphic synonym for this ancient culture. 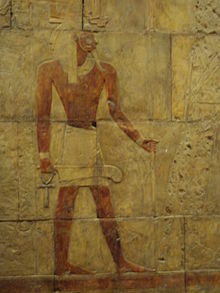 Due to this context, as well as due to the fact that many pictures of Egyptian gods and goddesses contained the symbol ankh in their hands, this symbol was adopted as a symbol of modern religion calledKemetism (although different Gnostic sects have long used this symbol), which is reconstructing the ancient Egyptian religion at the present. Many neo-pagan, New Age, and pagan sects wear the ankh as a symbol of power and wisdom or to show that they honor the Egyptian pantheon. It is commonly seen in jewellery such as rings and necklaces and despite its earlier uses it is cast in silver (versus the gold or copper the ancients used). Mika Waltari, who wrote the fictionalized documentary/novel The Egyptian in 1949, wrote of the origin of monotheistic culture in ancient Egypt, where the ankh first appeared as the symbol of this following. The first pharaoh to take on the name “ankh” within his own was the well known boy king, Tut-ankh-amun. 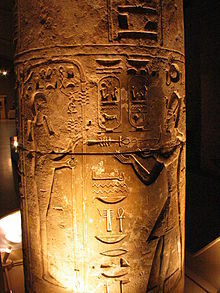 According to this young king’s father, Aten was the only God, symbolized by the sun resting on the horizon; thus the circle resting on a horizontal bar. It is a common misconception thatTutankhamun did not die a natural death, but was challenged in to a situation which brought about his injury and death. This, allegedly, (and quite possibly, through romantized fiction) was performed by those against this early monotheism. Professional wrestler Christopher Daniels has a tattoo of the ankh on his chest. The late singer Aaliyah had the ankh symbol tattooed on her right wrist. The ankh is a frequently recurring element in the video game series Ultima, being the main symbol of the in-game religion, where it represents power and virtue. In the MMORPG game World of Warcraft, it was used by characters known as Shamans to cast Reincarnation. The item has since been removed and is no longer required for the spell. In the MMORPG game RuneScape, it is a very powerful offhand magic weapon. In the Crash Bandicoot video game series, the ankh appears as a reward from completing time trials or other challenges depending on the game, although they are referred to as relics instead of ankhs. In the first series of the Nickelodeon show House of Anubis the Cup of Ankh is the treasure the characters search for. A stylized ankh is also the symbol of the gothic metal band Theatres des Vampires. Guitarist Vinnie Vincent used the ankh for makeup design while a member of the rock group Kiss. Death, a character in Neil Gaiman‘s Sandman series, wears the ankh as a necklace. The ankh is also used as a symbol in The Red Pyramid by Rick Riordan. The ankh was used as symbol of eternal life in Canadian TV series Dark Oracle. The ankh was used by experimental Jazz musician Sun Ra in his performances and album covers. The ankh is used in Terry Pratchett’s Discworld series of novels as part of the capital city, Ankh-Morpork. The AnkhSVN software, a client for the Subversion source control management system, derives its name from the ankh. The DC Comics character Doctor Fate is frequently shown using powers or symbology that includes the Ankh. The Ankh is held by a statue in the show LOST. The Ankh is an item require to move forward with the plot line of Konami’s “Silent Hill” for PlayStation. This is used to pass through Alyssa’s room. 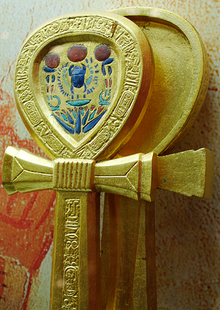 The Ankh is frequently shown in the music video of the Ace of Base song “The Sign”. In Citizen Smith the character Wolfie wears a metal Ankh symbol round his neck. 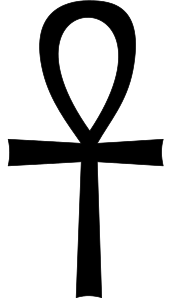 In the Vampire: the Masquerade role-playing game the symbol of the Camarilla is an ankh. The symbol of its rival, the Sabbat, is an inverse ankh studded with jagged thorns. In the CTV TV series “The Listener”, Paramedic Toby Logan (Craig Olejnik) has an Ankh tattooed on the inside of his right arm, just below the wrist. The TARDIS key in Doctor Who has, at times, been shaped like an ankh. It is an important item in the “Yu-Gi-Oh!” series. Called the “Millennium Key”, Shadi wears it around his neck and uses its power to see inside of people’s minds/souls. ^ Inman, Thomas. Ancient Pagan and Modern Christian Symbolism, Second Edition. New York: J. W. Bouton, 706 Broadway. Published 1875. Page 44. ISBN 978-1-4209-2987-4. ^ A Guide to the Third and Fourth Rooms of the British Museum (London: s.n. : 1904), 210. ^ Gordon, Andrew Hunt; Schwabe, Calvin W. The Quick and the Dead: Biomedical Theory in Ancient Egypt First Edition. Leiden ; Boston : Brill : Styx, 2004. ISBN 90-04-12391-1. ^ “Ankh – Ancient Symbol of Life”. Retrieved 4 November 2012. ^ “Aaliyah MTV Stripped [24 min Interview”. YouTube. 2001-04-26. Retrieved 2012-08-31.